Last night, I was fortunate enough to attend a lecture at our school given by Howard Gardner. For those of you who don’t know who he is, you can read up on his contributions to cognition and education at this link. In his lecture he discussed his book, Five Minds for the Future. Two of the “minds” resonated with a struggle that I have been having with my 10th grade biology students: the disciplined mind and the synthesizing mind. We are currently studying digestion. As an introduction to mechanical and chemical digestion, we followed a meal through the system in an organ sequence. 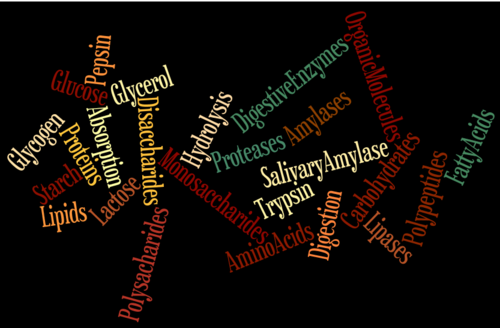 As with most topics in biology, there is a large amount of vocabulary involved. After doing several activities, I quizzed the students over their knowledge of the enzymes, substrates and processes involved in digestion and discovered a contradiction in their learning. The good news was that the majority of my students had managed to memorize the information. The bad news was that they memorized the information as a series of discrete, disconnected facts that followed the sequence of organs in digestion and could not apply them to the bigger concepts in biology. What my students lacked was the ability to synthesize the large volume of information they had learned and apply it to different contexts. So today in class, wrote a jumble of 26 words on the white board including two words that we had not discussed. I then divided them into mixed-ability, collaborative groups and instructed them to create a concept map that would connect all of the words on the board in a way that accurately showed the relationships between the words. The only rules I gave them were that they could not repeat words in their map, they could not use organs or organ sequence as an organizational strategy, and anything they didn’t know they had to discover on their own using internet resources. For added incentive, there was a prize for the first group that could convince me of their organization of terms. Though they struggled quite a bit at first, I was impressed by the engagement of the students at all levels and the learning that went on throughout the process. The hardest part for the students was to think of the concepts as disconnected from the organ sequence. Once they started to regroup the terms using different organizational rules, they began to visualize them in a different context and were able to grasp the larger applications of enzyme digestion. What surprised me the most was the fact that the groups came up with logical arrangements that I had not predicted. By the end of the activity even the weaker students experienced “aha” moments. …or perhaps a synthesizing mind.